On the Friday before Easter, Sarah, Andrew and Olivia came over to take some impromptu Easter photos of Olivia. And this one? Well, at first I considered it an outtake. She wasn't looking at the camera after all. But, boy. Was I wrong. This photo? This photo is sooo Olivia. Wispy blonde hair with a sweet pony tail. And that bright colorful bow? That is almost her signature fashion item. She always has one on her head when she is out and about. So what I had thought was a bad photo, was actually, a photo that was spot on. To create this layout, I realized the 'Dear Lizzy' heart cut file in my Silhouette software. I then back the cutouts with scraps from my March Gossamer Blue kit. And a couple sweet buttons, an Elles Studio 'documented' tag tucked in, and a trio of enamel dots and this page was complete in no time at all. What a stunning layout. I love the cut file. I think I may need that in my library. Oh so sweet. What a precious picture. Gorgeous! OMG! 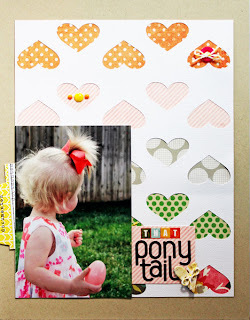 The layout is adorable and the photos is awesome! Your layout is perfect for that precious photo! Love those colorful hearts. Wonderful! Very pretty page. Love those hearts with all the different papers peeking through. sweet story and lovely photo!